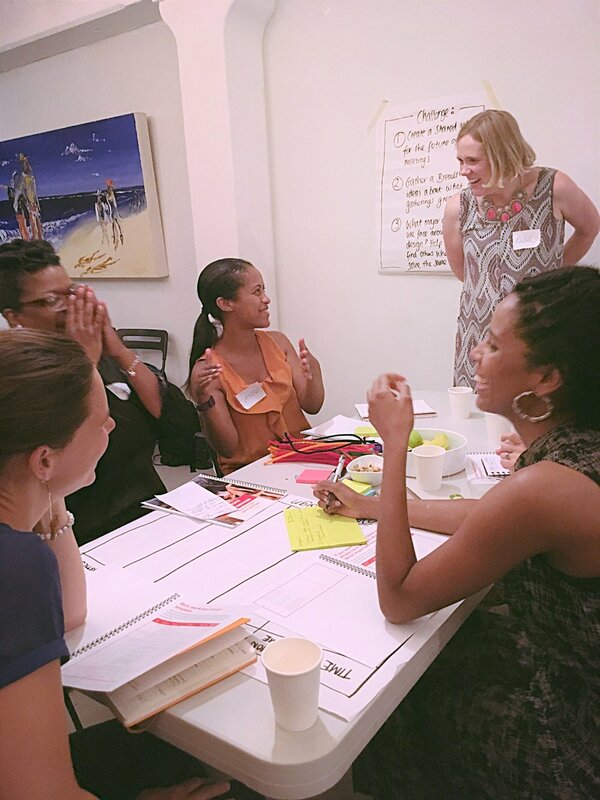 On July 20th we hosted a workshop in NYC on how to make gatherings remarkable. 13 participants attended, ranging from representatives of IFAC (The International Federation of Accountants), the UN, to community organizers working with Syrian refugees. The session followed Theory U in structure. We began by 'Sensing', learning about the building blocks of good event design, from how to set the room up to sharing our own experience of effective workshops and allowing participants to break up into small groups and design their own workshop. During our 'Presencing' phase, we focused on how to be present during facilitation. Former ballerina Alina Faye led us in a meditation and a fun exercise where the group copied each others' posture, so that we could reflect on how we present ourselves to the world. Alina shared tips on how to stand tall and walk with grace. We moved into an interactive session where the groups took it in turns to facilitate the rest of the group in their design. We reflected on what went well and what we'd do differently. It was a brilliant day full of laughter, learning and new connections and feedback was excellent. "I had the pleasure of attending Rachel workshop and it was one of the best opportunities I had in a long time. I was at a point of my career where I wanted to bring inspiration and excitement to my role as meeting coordinator.The workshop taught me how to apply methods of creativity to mundane agendas. Also her methods of design taught me to speak more confidently, rightly apply playful strategies and lead smart-interactive exercises with my staff and committees. And as a result, I facilitated, what staff are now calling, the ‘best’ town hall meeting ever. Her workshops are unique whereas it forces you to pay attention to your own behavior and to value your power to change the situation. I look forward to attending more of her workshops to sharpen what I’ve learned so far."